Heat a large skillet over medium high heat. Add a few light drizzles of olive oil. Once the oil is hot, add the sausages. Pan sear the sausages until they have browned beautifully on all sides, but do not cook the sausages all the way through. This should only take about 1 minute per side. Don’t worry if the sausages burst. Set aside. Heat a large, heavy bottomed sauce pot or dutch oven over medium heat. Add a few light drizzles of olive oil. Once the oil is hot, add the garlic and stir until lightly browned and fragrant. Then add the cans of tomatoes with juice, onion, carrots, and bay leaf. Increase the heat to high, cover the pot with its lid and bring the tomatoes to a boil. Then add the sausages to the pot and bring it back up to a boil, covered. Reduce the heat to maintain a simmer for 1 hour, stirring occasionally. By this point, the sausages should be cooked through. Use tongs to remove the sausages from the pot and set aside. Then remove the pot lid and adjust the heat to allow the sauce to gently simmer until the sauce has reduced and the desired consistency has been achieved, approximately 40 minutes. Stir occasionally. Keep in mind that the sauce will continue to thicken as it cools. Add salt and pepper to taste. While the sauce is simmering, slice the sausages crosswise into 1/3 inch to 1/2 inch thick pieces. Ideally, you want to time it so that your pasta is finished cooking at the same time as your pasta sauce. So while your tomato sauce is simmering, bring a large pot of water to a rolling boil over high heat. Add a generous pinch of salt to the boiling water and add the dried pasta. Cover the pot with its lid and bring the water back up to a full boil. Remove the lid and reduce the heat slightly to maintain a strong boil. Cook the pasta until al dente or other preferred doneness (I like my pasta to be softer than al dente but still slightly chewy). See the package instructions for cooking time guidelines. Strain the pasta well and transfer it to a large, heat safe bowl. When the pasta sauce is done, use tongs to remove the bay leaf, onion pieces, and carrot chunks. Stir the sausage slices, basil, and parsley into the pot of sauce, and bring it back to a boil. (Note: This sauce can be made days in advance and then brought back up to a boil as the pasta is being cooked. If you are making the sauce ahead of time, do not add the basil or parsley until you have reheated the sauce, just prior to tossing it with the pasta.) Pour 3/4 of the tomato sauce onto the drained pasta in the large, heat safe bowl. Toss well to combine. 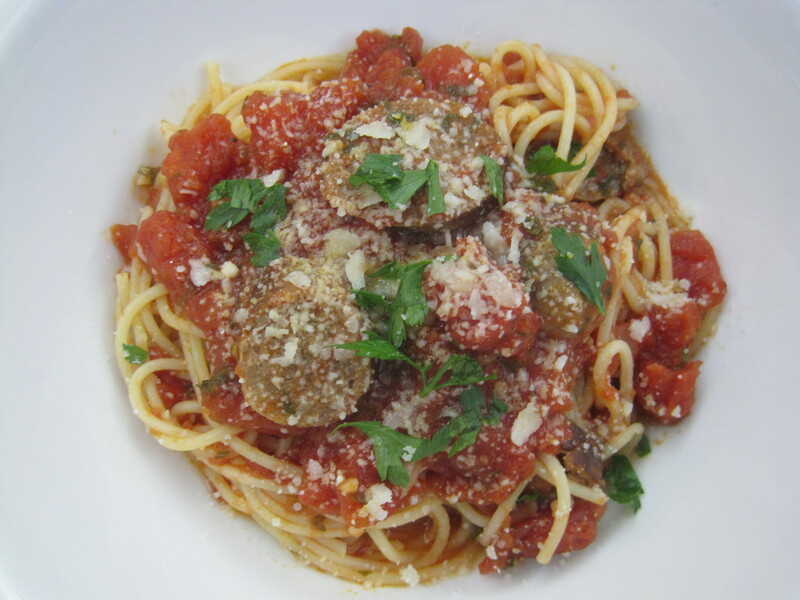 If you are serving this dish family style, spoon the remaining tomato sauce all over the top of the tossed pasta. Garnish with parsley or basil, and serve the pasta with the grated cheese on the side. Alternatively to having self-serve grated cheese, you could sprinkle some over the pasta just prior to adding garnish. Serve immediately. This dish tastes best when it is still piping hot. If you are serving plated dishes, then dish out the pasta into individual serving bowls or plates and spoon the remaining tomato sauce over each of the pasta servings. Garnish each plate with fresh parsley or basil, and serve with the grated cheese on the side. Alternatively to having self-serve grated cheese, you could sprinkle some over each pasta dish just prior to adding garnish. Serve immediately. This dish tastes best when it is still piping hot. This is a freezer friendly meal.